Do you have a hectic lifestyle and want to make positive life changes but precious little time to make them? Move from London to live in the idyllic countryside and do my dream job as a successful Psychotherapist, Coach and Mindfulness Teacher helping 1000s of clients at my Liverpool Street and Harley Street Practices and nowadays at my online, Bristol and Somerset Practices sometimes advising film Directors, such as Mike Leigh, on the authenticity of film narratives. 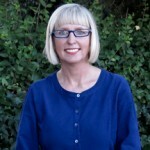 Though I am now doing my dream job, living in a delightful Somerset village and have many tools at my disposal, life is occasionally still tough so I’ll also send you some tips to help you remain motivated, and focused when you are feeling stuck, overwhelmed, lost or you are falling victim to ”l’m too busy and don’t have enough time” and procrastination trap. So what are personal boundaries? Personal boundaries are guidelines, rules or limits that a person creates to identify for him or herself what are reasonable, safe and permissible ways for other people to behave around him or her and how he or she will respond when someone steps outside those limits. They are built out of a mix of beliefs, opinions, attitudes, past experiences and social learning. Personal boundaries define you as an individual, outlining your likes and dislikes, and setting the distances you allow others to approach. They include physical, mental, psychological and spiritual boundaries, involving beliefs, emotions, intuitions and self-esteem. How do you establish whether your boundaries are healthy? Are you a people pleaser who frequently agrees to do things that you really don’t want to do? Do you allow insulting, off hand remarks from pushy, aggressive people because you are anxious or fearful of the consequences or of potential conflict? Are you over sensitive and often take things personally? If you have answered yes to one or more of these questions then your boundaries are probably not as robust as they could be. We have all struggled with boundaries from time to time especially with our parents and those closest to us. We are not taught how to do this at school, so how can we be expected to know how to set healthy boundaries? I believe boundary setting should be a mandatory item on the school curriculum. What is a healthy boundary then? Ideally, the ability to set flexible boundaries. Soft – A person with soft boundaries merges with other people’s boundaries. Someone with a soft boundary is easily manipulated. Spongy – A person with spongy boundaries is like a combination of having soft and rigid boundaries. They permit less emotional contagion than soft boundaries but more than rigid. People with spongy boundaries are unsure of what to let in and what to keep out. Rigid – A person with rigid boundaries is closed or walled off so nobody can get close to him/her either physically or emotionally. This is often the case if someone has been physically, emotionally, psychologically or sexually abused. Rigid boundaries can be selective which depend on time, place or circumstances and are usually based on a bad previous experience in a similar situation. Flexible – This is the ideal. Similar to selective rigid boundaries but the person has more control. The person decides what to let in and what to keep out, is resistant to emotional contagion, manipulation and is difficult to exploit. Whilst a healthy relationship depends on the emotional space provided by personal boundaries, co dependent personalities have difficulties in setting such limits, so that defining and protecting boundaries efficiently may be for them a vital part of regaining mental health. Following extensive boundary setting training on my Psychotherapy Master’s Degree, the knowledge I acquired , outlining how to set consistent, timely, flexible boundaries, has made a significantly, positive difference to my life. The first step is self awareness, that is, acknowledging that you experience difficulties with boundary setting. For most of us, the act of saying no is simple it takes a second. It’s not saying no that bothers us though it’s the consequences that concern us. Avoid using but as it carries negative connotations and instead use words like and however. Let me know how you get on ask me another time or I’d love to know how you get on. I’m organising an amazing event and I’m looking for someone just like you to help with the organising. It will be great fun and it’s all for a good cause. Wow well first of all thanks for asking. I’m honoured. However, I’m going to miss this one as I’m committed to several important things at the moment which all need my time and attention. It wouldn’t be fair on them, or you, if I said I could get involved with something else and then did a poor job with everything. Let me know how it goes though. Wow thank you for thinking about me. It sounds like a great project and I’m up for a challenge. To take it on and do a brilliant job I need your help. Could you help me to find a couple of hours a day by reassigning some of my other responsibilities? I know Giles has done data input in the past so he would be great at that. I feel uncomfortable when you shout at me, so I’m going to leave the room until you calm down. It’s not OK with me that you continually put me down and criticize my appearance so I’d like you to stop doing this. “I don’t know what I’m doing that evening yet and I have a policy of not making decisions right away so I’ll get back to you later in the week. (If the person persists and tries to manipulate or make you feel guilty, keep repeating this statement to them over and over again). I know I agreed to help you with the flower show, after reviewing my diary though, I now realise that I won’t be able to give it my best attention so I’m happy to help you find someone else by the end of next week. Q Would you buy a newspaper when you drop Charlie off at the scouts? A Yes of course. And I need your help with something. Would you empty the dishwasher while I’m out. Q Could you take care of the phones while I’m away? Ill be back in an hour or so..
A No problem at all, and actually you could help me. Would you mind dropping this off at the Post Office while you’re out? Assertiveness is: “the ability to honestly express your opinions, feelings, attitudes, and rights, without undue anxiety, in a way that doesn’t infringe on the rights of others”. Could you tell me more information so that I can understand what you are trying to say? When is a good time for us to talk about something that has been bothering me? These make for great conversation openers because blame is avoided, and may allow the other person to save face or take responsibility before becoming emotional. If you are used to arguing with someone and suddenly try this, you may get quick improvements in communication. If the other person becomes aggressive or passive you can continue with “I” statements. 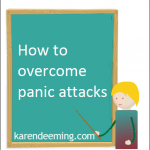 If after reading this blog you are still struggling to remain in the here and now, reach decisions and are feeling overwhelmed with distractions and negative thoughts because of this, don’t panic or give up just yet. 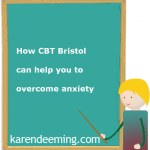 Counselling, psychotherapy sessions or a personal development or mindfulness course can help you. 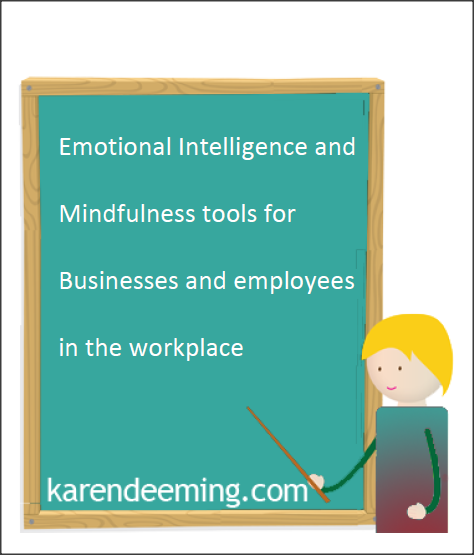 So, if you need a bit of extra support and encouragement and a few on line, telephone or face to face counselling or mindfulness sessions why not contact Karen Deeming to arrange an appointment or for a short free introductory chat on 07950 751352 or send an email to: info@karendeeming.com. If your answer to one or more of these questions is yes then you may benefit from Mindfulness. 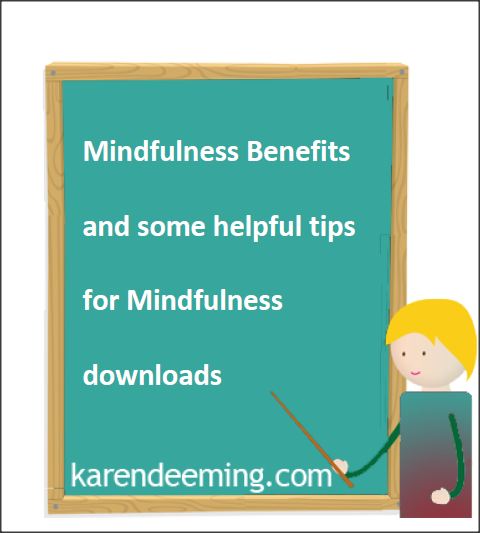 Mindfulness is a scientifically based tool designed to help reduce stress, panic attacks and anxiety and has been widely approved by the international medical community. It teaches greater awareness of our thoughts, feelings and sensations through simple techniques like meditation and gentle movement. And you don’t need to sit cross legged in the mountains to do it!!! The ability to achieve a successful work life balance in order to live more creatively and fully has never been more important than in today’s society. Unless you take more quality time on your own, you will always experience emotional and physical difficulties from the beginning of your working life until the grave. How does Mindfulness work in practice? Practice the three minute mindfulness breathing space meditation below not cross legged on a mountain in the Himalayas at your desk or sat upright in a chair at home, in your business hotel or on the bus or tube if you live in London. Whilst listening to the 3 minute mindfulness breathing space, just allow your thoughts to rise, plateau and fall and imagine that they are part of a film/tape or actors in a play coming and go or clouds in the sky and that you have the option to press the stop button at anytime. Most importantly, remember that thoughts are not facts and are only your own interpretation of emotions and feelings and other people’s actions and so when you next experience a negative automatic thought write it down and ask yourself what evidence is there to support this thought and what evidence is there against this thought. 1. Regardless of what happens (eg if you fall asleep, lose concentration, keep thinking of other things), just do it! These are your experiences in the moment. Just be aware of them. 3. Let go of ideas of “success “, ” failure “, ” doing it well “, or “trying to purify the mind “. This is not a competition. It is not a skill for which you need to strive. The only discipline involved is regular and frequent practice. Just do it with an attitude of openness and curiosity. 4. Let go of any expectations of what the 3 minute mindfulness breathing space will do for you. Imagine it as a seed you have just planted. The more you poke around and interfere, the less it will be able to develop. So with the 3 minute mindfulness breathing space , just give it the right conditions – peace and quiet, regular and frequent practice. That is all. The more you try to influence what it will do for you, the less it will do. Focusing on the breath fills some people with a sense of dread so are there any alternatives to the three minute breathing space? Just allow your thoughts to rise, plateau and fall and imagine that they are part of a film/tape or actors in a play coming and go or clouds in the sky and that you have the option to press the stop button at anytime. 2. If your mind is wandering a lot, simply note the thoughts (as passing events) and then bring the mind gently back to the sounds around you. 4. Let go of any expectations of what the sounds and thoughts mindfulness meditation will do for you. Imagine it as a seed you have just planted. The more you poke around and interfere, the less it will be able to develop. So with the sounds and thoughts mindfulness meditation, just give it the right conditions – peace and quiet, regular and frequent practice. That is all. The more you try to influence what it will do for you, the less it will do.